“I’m tired to the death”, says Willy Loman in Arthur Miller’s searing family drama. It has an even more chilling resonance for this Royal and Derngate revival, which was originally due to open in April, but was derailed first by the withdrawal of Pamela Miles, who was playing Linda Loman, because of a broken bone sustained during rehearsals, then less than a week later by the sudden death of her real-life husband Tim Pigott-Smith, who was to play her stage husband Willy Loman. The subsequent planned tour was salvaged by the casting of Tricia Kelly and Nicholas Woodeson in those roles and the production has now been dedicated to the memory of Pigott-Smith. Seeing it at the venue in which it was supposed to open, the production acts an honourable memorial; it’s an initially low-key, but eventually blistering account of a truly great play. Director Abigail Graham and her designer Georgia Lowe sweep away a lot of the naturalistic trappings of the play – the set is a three-sided smoked glass wall, with only a double bed stage left, a hulking fridge and a table and four chairs, presided over by a flickering sign in white strip lighting spells out, in large letters ‘Land of the free’ – words that later turn blood red. 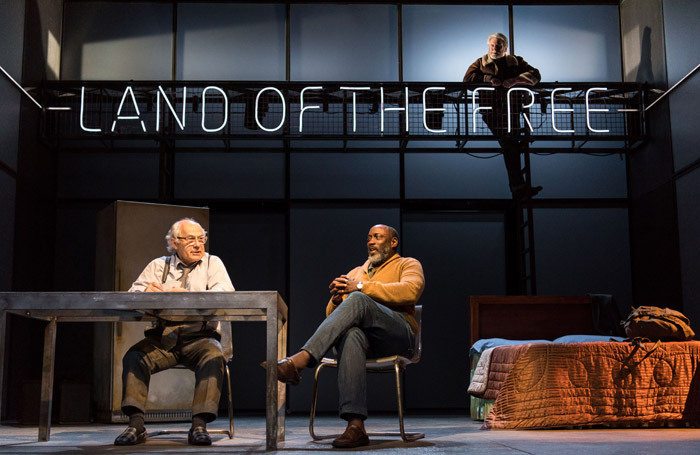 That may be a rather heavy-handed way to spell out the play’s layered ironies, and some of Graham’s interventions, with movement director Jennifer Jackson, have a Frantic Assembly/Steven Hoggett flavour of underlining the family tensions further. But if there is an over-explicit reliance on such effects, the production shifts seamlessly between the imaginative flashbacks of Loman’s troubled psyche and the here-and-now. The past is dredged up and re-played in a memory play of bad conscience as Loman wrestles with the guilt that has led his previously devoted son Biff to turn his back on him and squander his own opportunities. The show is galvanised by two monumental performances from Woodeson as a gruff, combustible Loman and Kelly as his pained wife. Woodeson is a physically a very different kind of actor to Pigott-Smith – short and stocky versus lean and patrician – but he has a coiled and crumpled intensity that is heartbreaking. Kelly’s anguish and loyalty is palpable. As their sons Biff and Happy, George Taylor and Ben Deery are also superb, coming to terms with their own failures and that of their father. A supporting cast, that includes Geff Francis as neighbour Charley and Michael Walters as Charley’s high-achieving lawyer son Bernard, gives the play heft and texture.